Oscar’s first encounter with Blast Theory was in 2007 when he strolled into Lighthouse Brighton to take part in Day Of The Figurines. He sat in the Pavilion Gardens playing the text based adventure with friends, five years later he began his volunteer placement at Blast Theory. Oscar is a traditional hand-drawn and digital animator who studied Animation at the University of the Creative Arts Farnham. A keen computer game enthusiast with an analytical approach to games, he seeks to combine his interest in games with his skills in motion graphic and animation. Oscar attends regular life drawing classes and considers it an integral part of his work and development as an animator. He is also part-time manager of Carats Café Bar, a busy Brighton café. Since volunteering Oscar has continued to work with us on projects such as I’d Hide You at Sheffield Doc/Fest 2014. I was very happy to spend two months at Blast Theory, undertaking a huge variety of tasks and lucky enough to be involved in some great projects. I carried out smaller tasks like archiving, equipment purchases and tests, website testing and preparing cheese banquets for Blast Theory’s guests. But I was also lucky enough to be involved in some more major projects. The most enjoyable experience was the film shoot for the project Counterproductive. With actors, spy cameras, bolt cutters and unwitting members of the public, it may have been the most exciting working week I have ever had. I was also incredibly happy to have some responsibilities for the Brighton Festival running of Fixing Point. Working closely with artist Nick Tandavanitj I learned the strict and regimental methods behind testing a phone application. Editing lines of code and performing multiple tests gave me a valuable understanding of programming for applications. 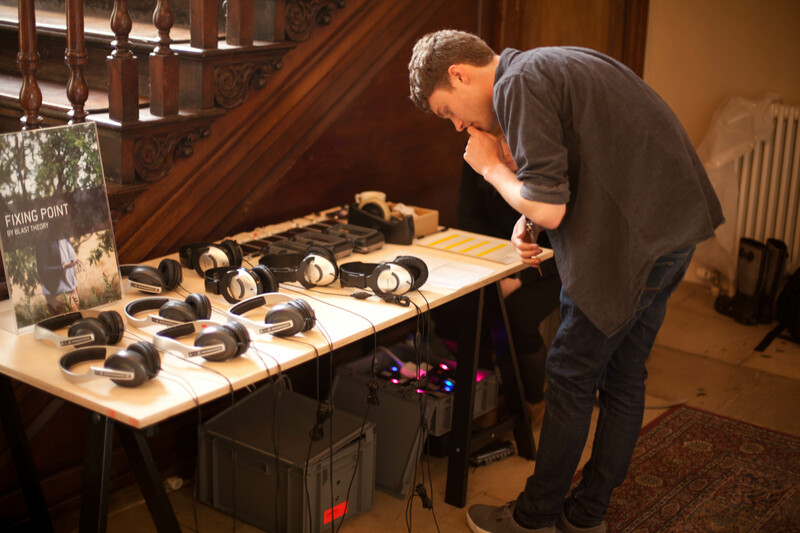 I was involved with site visits to Stanmer House, and when the show was up and running I gained first hand experience in dealing with the public participating in Blast Theory’s work and leading a small team of invigilators in running the Front of House. My work as a volunteer was greatly varied and gave me a good idea of where my skills lie. Artist Ju Row Farr gave me some valuable mentoring in my professional development. Overall, I especially enjoyed being part of the artistic collective. Witnessing how Blast Theory is run on a day to day basis; the combination of an organised workspace, artistic vision and a casual, friendly working environment showed me just how an arts organisation should be run.